When managing multiple projects it always challenging to give all your stakeholders or senior management a view of the current status of the project. This multiple project dashboard template provides a way showing your portfolio status in a graphical fashion. Covers the key project KPI like Schedule, Budget, Resources, Risks &Issues and Quality Metrics. Project Schedule or project plan is displayed as % complete and an indicator to display the status. A green arrow indicates things are going well, an amber arrow indicates there could be delays and red means behind schedule. Project Budget displays planned and actual cost incurred so far. Resources is a unique way of indicating if the project is well resourced. You can either display the number of resources or display the entire box with green resources to indicate all is good. A red resource means there is a shortage of resources in that project. The number of red resources can be equal to the number of resources short on your project. 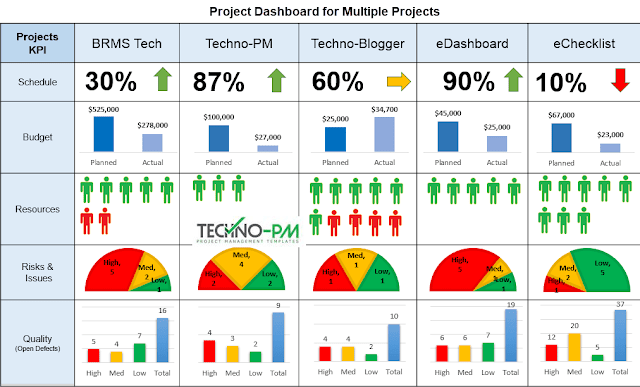 The project dashboard template can accommodate up to 5 projects. Risks and Issues display the number of risks and issues that affect the current project. The pie chart displays all the high risks/issues in the red, medium risks/issues in amber and low issues in green. Quality helps stakeholders to understand the current state of the project testing phase. The quality metric chart displays the high issues as red, medium as amber and low issues as green. The chart also displays the total count of issues currently open. If required this dashboard can be used for projects run in an agile fashion. Right click on any of the charts to edit the numbers. Right-click and select Edit Data. If you want to edit the basic chart itself then right click and select Edit Data in Excel. When sending the project dashboard or status in an email it is advisable to generate a PDF as the PPT file can become very large in size. PDF files are generally smaller in size. If you feel any of the sections are not adequate then feel free to replace them. Display the dashboard in a common area or big screens you have in your organization. Where can you obtain the excel Dashboard for Multiple Projects? There is a link at the bottom of the article which will take you to dropbox.